Peter Parkinson - Heritage Funeral Homes Inc.
of Palmerston passed away peacefully at the Grand River Hospital on Sunday, November 25, 2018 with family at his bedside in his 68th year. Survived by his wife Patricia Anne Parkinson (nee Pierson) for 42 years. Dear father of Ivan Parkinson and his wife Emily and Amanda Parkinson and Sean Meek. Grandfather of Thomas, Robert and Alice Parkinson. Son of Margaret Isabelle Parkinson (nee Major) and the late Donald Leonard Parkinson. Brother of Randy and Lena Parkinson, Reid and Bonny Parkinson, Terry and Debbie Parkinson, Sally and Len Songer and Francis Parkinson. Nephew of Jean Jackson and Betty Major. Remembered by his nieces, nephews, extended family and friends. He will be missed by his employees and dogs. 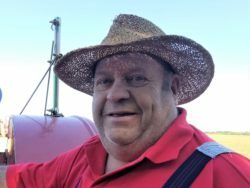 Peter will be remembered for his love of farming, farm equipment, and trucks. He spent his life farming and trucking and was happiest when demonstrating threshing with his antique tractor. Peter was a complex medical patient and was blessed to be able to stay at home thanks to the support and medical care of his loving wife Pat. To honour Peter’s wishes cremation has taken place followed by a private family service. Family and friends are invited to the Moorefield Community Center on Sunday, December 2, 2018 from 1:30 to 4:30 p.m. with remembrances at 3:30 p.m.
As expressions of sympathy the Diabetes Association, Palmerston Hospital Foundation or Home Hemodialysis care of the Grand River Hospital Foundation would be appreciated by the family.